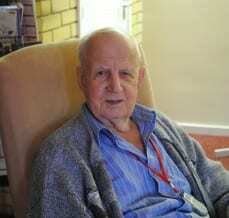 Bill is 89 years old, of considerable good health, and has enjoyed living at Royal Court Care Home for 2 years. Bill previously had a bath in his one bedroom flat and consequently needed a carer to help him. Having a new wet room has made a big difference to his independence and he has also felt it easier to get in and move around now. “It’s grand! I had to have a carer to help me before in the bathroom when I had a bath but not now as I can do it on my own and it gives me something to do! The grab rails also help and give me more security”.